We've been promoting the arts for decades. You'll find our artists do all types of work here. In the early 1950's in Llano and the lake area there was not an art guild and no organized art classes being taught although there were several persons who did enjoy painting on their own like Polly Love and Leila Robertson who had studied oils, watercolor and sculpture in Europe, Mexico as well as in several major cities of the United States. Among those who realized that the area needed emphasis placed on art were two friends, Anne Harrison and Stella Hoerster active officers in the Woman's Culture Club of Llano, who saw an opportunity for a club project as well as a way to make a contribution to the cultural climate of the community by inviting and an art teacher to Llano. Head of the English Department of the University of Texas was Dr. Mody C. Boatright, a well known folklorist and his wife Elizabeth Keefer an all-media art instructor whom Anne knew, and and contacted asking her to recommend a teacher who would be willing to come to Llano and teach. Mrs. Boatright replied, “I 'll come myself because I feel I owe it to others to share the training and knowledge that I have.” Because of this unselfish sharing of herself, Anne called her “Llano's Art Missionary.” For two years Mrs. Boatwright held watercolor classes. The class members in addition to Anne Harrison and Stella Hoerster were Leila Robertson, Polly Love, an Lillian Fowler who was renting an apartment across the street from the Elementary School where she taught piano students while she waited to take her own sons and children of her neighbors to their ranch homes after school. Other members of the class were Marie Renick, mother-in-law of long time member of Llano Fine Arts Guild member Pat Renick. Doris Swenson Porch, Lawrence Bruhl and several others. This loosely organized group was known as the Llano Watercolor Society. The semi-monthly classes were held in the rooms and large screened porch upstairs in the newly acquired clubhouse of the Woman's Culture Club located on the corner of Sandstone and Wright Streets. But interest lagged and the group disbanded after two years. In 1963, a struggling group of painters from Buchanan Dam invited all interested painters to participate with them in a show held at Observation Point, Lake Buchanan. The Llano artists were impressed with the work of Dollie Nabinger of Fredericksburg and later invited her to come teach oils in Llano. The six charter members, in addition to Mrs. Stribling, were Lilian Fowler, Vergie Cornelius, Irene Davis, Mary Underwood, and Stella Hoerster. The Llano Fine Arts Guild is in the process of revitalizing and rebuilding our membership as we celebrate this wonderful milestone. Please join the fun by becoming a new member, supporter, donor or patron. 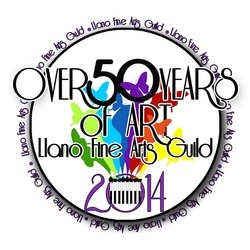 Help us keep the arts alive in Llano, Texas!